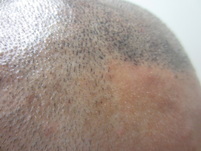 Scalp Micro Pigmentation (SMP) can be an option for patients who have short hair and do not have good donor area for restoration in a hair transplant procedure. Tattoo ink is placed in a precise manner to produce a hair-like look. Because a tattoo is used, this method is also known as scalp tattoo hair camouflage. 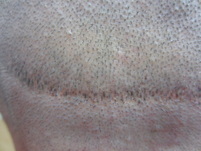 Scalp micropigmentation can also be used to help cover up a line scar from an FUT hair transplant procedure. Here you see a hair line created with scalp micropigmentation.